5.91 points at 11 votes (rank 658). 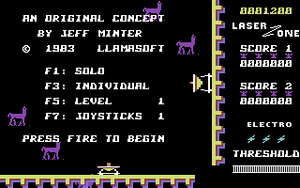 A game by Jeff Minter without camels or other humped animals?? No, it isn't because in the front credits they already fall over the screen. To the game itself: The graphics are simple but pleasant, as in all of his games, same is for the sound and the FX. The game idea is also not revolutionary, but the execution is very good. The best are the filed 2-player options (team, against each other), these makes the game stand out from the crowd of other shooters. F1 = Solo/Competitive - In the competitive mode 2 players or 2 teams can play against each other in turns or together at the same time. F3 = Individual/Team- In the Individual mode each player steers both plasma beams, in the team mode one player controls the horizontal plasma beam and the other player the vertical plasma beam. 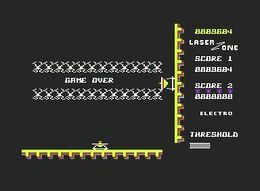 F5 = Level - There are 20 levels, the first 9 can be chosen by pressing the key F5. F7 = Joysticks 1/2 - You need 2 joysticks for the competitive mode. If a laser station leaves the screen on one side, it will reappear on the opposite side. To fire diagonally, you have to keep the fire button pressed and then pull the joystick forwards/right or backwards/left . Caution! With this shot you can also destroy your own laser or the one of your teammate. You can use a limited amount of this very effective weapon. It destroys all enemies that are on the screen. For this press the key C= . It can appear after the first attack wave. It moves on random paths and fires energy bolts onto both plasma stations. Additionally it is protected by a deflector shield. This can be destabilized by permanent fire, you can see the decreasing effect by the shield's colour. The version by "Crypt" has next to different trainers (unlimited ships, unlimited electric bolts) also a saveable highscore list. H.T.W: "Again a very indiviual, again a bit overvalued game by camel-lover Minter. As all his games, this also has its own flair and is well playable. But what tops it all is the team mode where each player steers one laser and where the word "cooperative" gets significance. Very recommendable...". 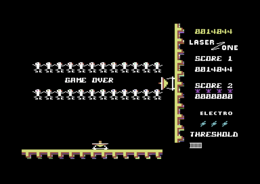 Robotron2084: "An ingeniously simple idea, which unfortunately gets compromised by the symptomatic sloppy collision query caused by the early stage of Jeff Minter's producing. Here simply too many shots go through the enemies, which goes too far. And that the UFO in the higher levels gives you exactly 2 nano seconds to move out of the line of fire is also not gentleman-like. And the originally well-intentioned possibility to shoot diagonally to clear the opposing axis often ends in the heat of the battle with unwanted shooting of the own gun. 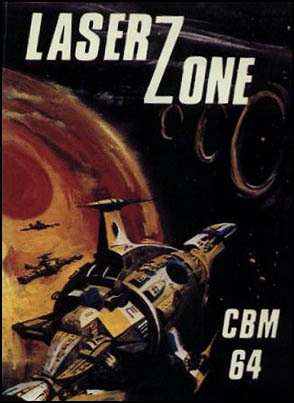 But otherwise Laser Zone is quite viable, especially in twos. 5 out of 10 points." Jeff Minter's personal highscore was 101.000 points at the printing date of the manual.